“Freak Show” is Coming to Dana Point! We’ve been working on a Halloween Night production of “Freak Show” that is coming together quite nicely. The live band is on contract, the magician and an artist reserved, and several folks selected to be in the “Freaks” side show. The decorating committee will be transforming the building into a tent with vinyl material draped from the ceiling and black lights with fog will do the rest to create the scary side of carnival life. Photos to come in November! 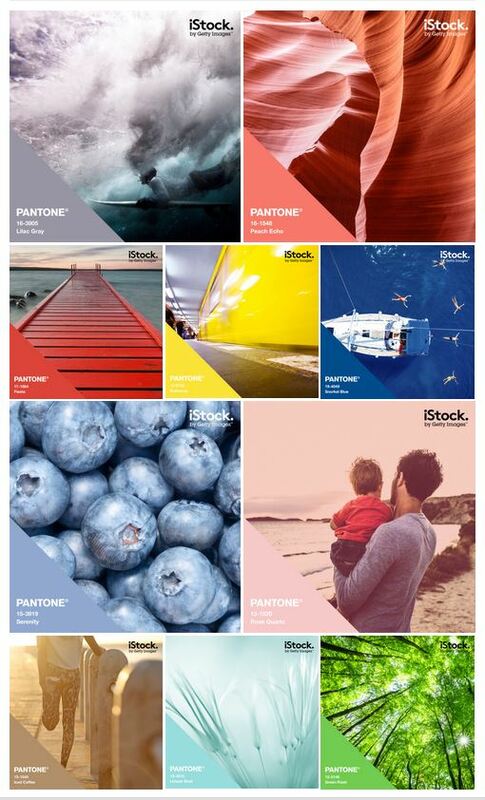 Pantone’s Spring 2016 Splash of Colors! I am so excited to see these colors! There’s balance with a full spectrum of emotions. We are definitely getting inspired, and I hope you are, too! Feel free to explore more by clicking on the link. 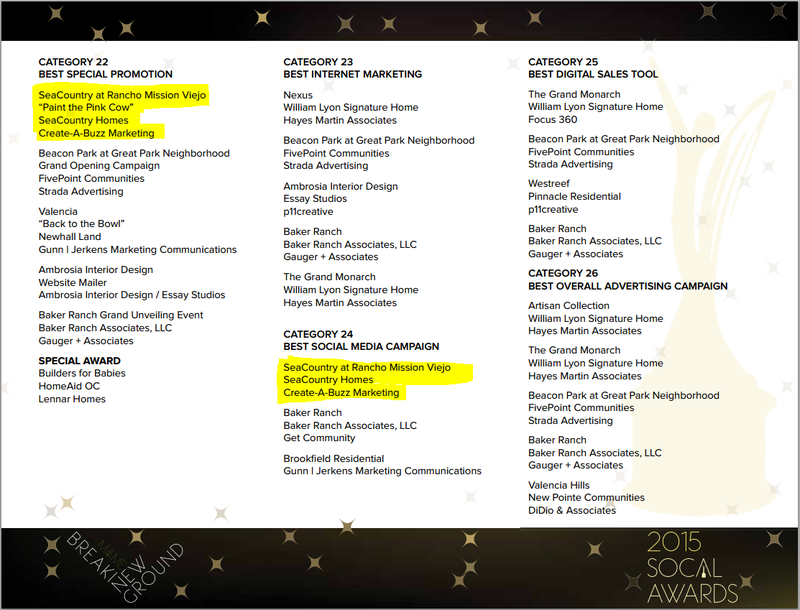 Create-a-Buzz is SoCal Award Finalist! It’s a great day when you find out your efforts have been acknowledged by your peers! Just to be in the same room with so many esteemed icons in the homebuilding industry is an honor for which we at Create-a-Buzz are so grateful! The team has worked hard, and I thank them all for their talent, creativity and dedication! Create-a-Buzz Marketing has relaunched a refreshed and updated service for the Real Estate Professional looking to identify their target market, develop a plan to attract that buyer and speed the sales process through a robust interactive marketing campaign. Professional Imagery – Please don’t make us look at your photos and videos taken with a smart phone! Home Staging – Make it pretty…clean it up, unclutter and depersonalize! Branded Designs – Set yourself apart from the competition by branding YOU and not your brokerage office! Digital Media – Let technology be your friend! Targeted Lists – Yes, tap the shoulder of both consumers and brokers to increase the property’s exposure! Self-Guided Tours – Don’t make them guess! Tell them what’s so special about the property even when you’re not demonstrating the home! Best part is that these services can be paid at the close of escrow, so in most cases you can greatly reduce your front-end marketing expenses…SWEET! Give us a call and let’s talk about how to get that house sold! Beatles are Coming to America Event! Here’s an example of a fun and digitally interactive invitational evite, meaning it has several links programmed for a quick and convenient response. While the example images aren’t programmed with links, you can see how the original HTML communications could motivate a timely reservation response immensely, not to mention give the event coordinator an easy tool for organizing responses with a programmed subject line in the email responses. Further convenience is a directions link so you don’t have to clutter the messaging with directions and maps. Another feature is adding a link to drive traffic to the website for more information on the organization, list of sponsors or any other additional information. Let us help you organize your next event and/or event communications with a Buzz Eblast campaign! SeaCountry is a wonderful client and they trust me to take the lead on all the marketing initiatives. I’m very fortunate to have fallen in with this amazing family-owned builder. Not only are they amazing at what they do, they put so much love and care into each home that resonates pride in every way.